I thanked Jeffrey in the last post on wet/dry. What was flashing through my mind while reading the post was the same strong sense of identification I got from the first paper I read on identity by a certain Prof Cohen. It was the first time I read something I agreed with strongly on the subject and was surprising and exciting. Works from start to finish. Place it alongside the sources I use it just works and adds clarity. Great stuff! Karl, you may find it helpful to look at some of the natural philosophy surrounding ideas of death, decay, and putrefaction. Book IV of De Metereologica is pretty canonical on how bodies desiccate and die and how putrefaction occurs. There are also a couple of articles on humidum radicale and the metaphor of the lamp that might be useful to you. I also have some references to articles (one of mine, one of someone else's) about putrefaction and moisture that you might find interesting. Feel free to contact me off-list, if you like. thanks Jeb, very pleased to hear it. and thanks ALSO ERT (by the way, folks: here's a medieval robots blog to add to your readers), who has been written by me. Looking forward to doing more putrefaction reading today. After all, what else can one do in the city of lights? ERT: just read your balm article. Great stuff, also! First, I'm clearly going to need to nuance my wet death/dry death. I'll also need to read the Patrice Georges, Peter H. Niebyl, Michael McVaugh, and *especially* the Katherine Park you cite, in addition to the Aristotle. Looking forward to it! BTW, you've seen Paul Strohm's Hector article in the anthology Lydgate Matters? It's short and fun and will be a nice supplement to what you're doing. The worms are active here, as you say, but is not their attention (and intention) centered on the human? 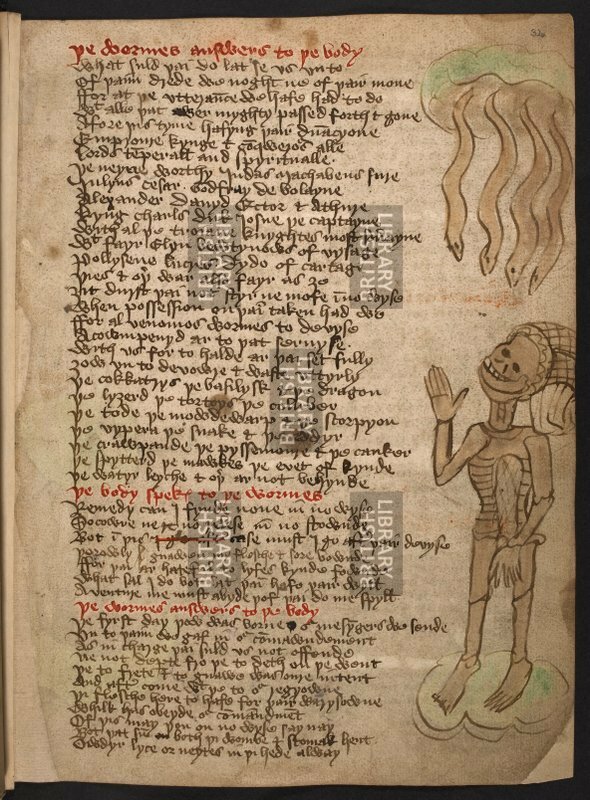 þi flesche here to hafe for þair warysowne. Karl: thanks for sharing your Abyss essay like this; it's very generous, and I've been enjoying it. It reminded me that a couple of years ago Nicola M. and Anna K. co-organized two panels on the post-abysmal and that there was much rich food for thought offered in those 2 panels [here and there, not in all the papers] regarding abysses as sites of productivity/natality/materialist re-shufflings. I reflect, especially after reading your posts, that the argument could be made for the abyss as a site of queer natality and new dis/orders [with dis/order here meaning something like "sick/dysfunctional orders" but also "Bakhtinian play which is productive of new meanings just under the nose of the dominant powers/readings"]. This might also be a way toward talking about the medieval post-human death abyss as one place where flat ontology [to cadge from Linda Charnes: http://emc.eserver.org/1-6/charnes.html] "crash lands" through a "worm-hole" from the future. Of course, medieval people thought/believed in the "after the abyss" period as well, and there are SO MANY contradictions and paradoxes inherent in what medieval people believed about the body during and after death, and I can't recommend Caroline Walker Bynum's "Resurrection and the Body" highly enough on this subject: it will give you lots of cites of primary theological texts that you might find very useful here. So what, then, might be your final aim here that might also make you feel a certain a stuckness, which we all always feel, in concluding? Do you want to argue for the abyss here as a site of teeming anti-hierarchical vibrant materiality? A networked assemblage of actants struggling with each other? A flat ontology [BUT: in the medieval world, can ontological flatness even be imagined, OR: do we pull a kind of reading against the historical grain and use Ian Bogost's idea of "unit operations" to say something like: look, the whole text and its illustrations is pulling in one, holistic direction that is conversant with certain medieval religious precepts/beliefs, but certain "units" within that text offer errant incoherencies, and maybe *obdurate* and *messy* materialities that pull it in other directions. Karl, thank you for this excellent work. I am glad you are in dialogue with Nicola, with whom I dialogued all-too-briefly regarding worms and regeneration at BABEL-Austin. 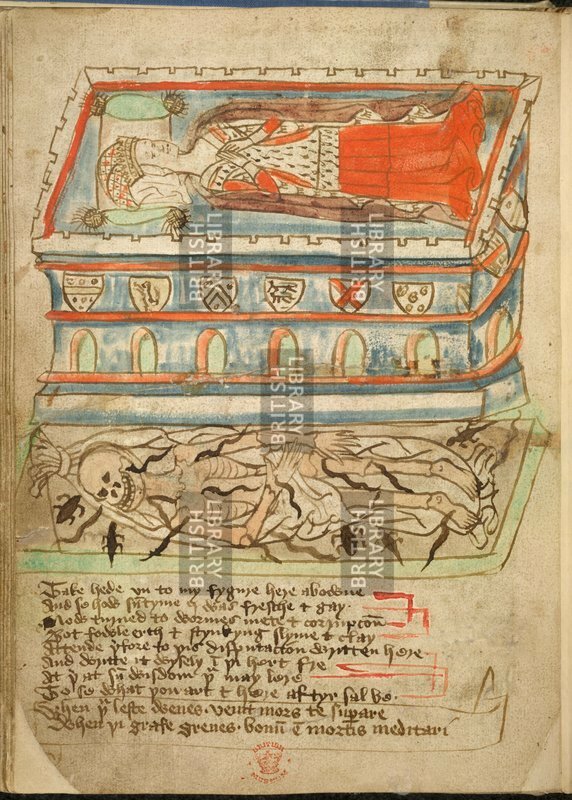 While finishing up some research for the book I was writing on images of death/dying, I viewed the Add 37049 manuscript at the BL, and I think there are some very interesting things going on in images of the rotting body in that manuscript that are perhaps not properly accounted for by the term "cadaver tomb." 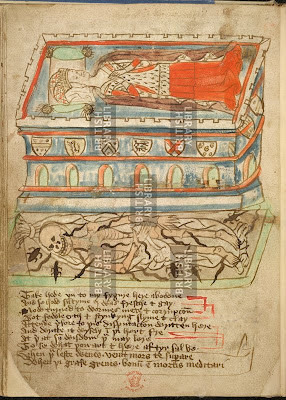 I think there are artistic signs in some of the related images--particularly the illustration of the Antiochenus episode on f. 86b--that we are meant to be seeing beneath ground, looking via a kind of "cutaway" into the earth, seeing the grave (note the foot position of the Emperor's son and the use of recessive space surrounding the body). This material did not end up in my book (currently under review), but I think the "wet" grass/ground of a grave, as opposed to the dry stone of a cadaver monument, might amplify some of your interests. 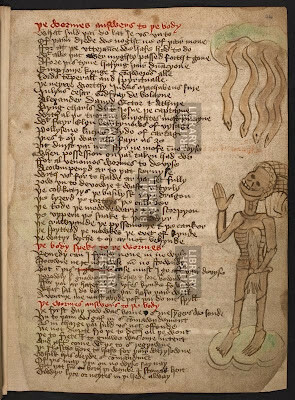 The artists of this manuscript are far cleverer than they have been given credit for. Also, have you read or re-read or re-encountered Bataille's _Erotisme_ in light of this wet-dry distinction, which is key to his notion of the repulsion/disgust of the decomposing body? "Spontaneous physical revulsion keeps alive in some indirect fashion at least the consciousness that the terrifying face of death, its stinking putrefaction, are to be identified with the sickening primary condition of life. For primitive people [sic], the moment of greatest anguish is the phase of decomposition; when the bones are bare and white, they are not intolerable as the putrefying flesh is, food for worms. In some obscure way the survivors perceive in the horror aroused by corruption a rancour and a hatred projected towards them by the dead man which it is the function of rites of mourning to appease. But afterwards they feel that the whitening bones bear witness to that appeasement. The bones are objects of reverence to them and draw the first veil of decency and solemnity over death and make it bearable; it is painful still but free of the virulent activity of corruption." (56 in Dalwood translation). Bataille's anthropology was suspect and hasty, to say the least, but his point in this section is crucial, namely that nausea is a construct of a social world built on the distinction from the animal world that we know, at a deeper level, we cannot sustain ("There is no reason to look at a man's corpse otherwise than at an animal's," he says); the recession of life into "continuous being" generates this anxiety of the loss of discontinuity, on which social existence is predicated. Worms, well, they are that animal whose profligate sexuality in the decomposing corpse most unnerves us because it most fully lays bare our own pretensions to animal difference. I don't know why my previous comment ended up "unknown" (I thought I logged in via Google), but I am known, if not to myself: Ashby Kinch.